Jan Willem TeSelle was born in Oostburg, Sheboygan County, Wisconsin on 31 Jan 1867. His parents were Jan Hendrik te Selle (1838-1921) and Hanna Berendina Onnink (1841-1929). When Jan Willem was about 3 years old, he moved with his parents and two sisters, Janna (1866-1946) and Dela (1869-1971), to Lancaster County, Nebraska. Jan Willem’s father was a farmer in Wisconsin, and was seeking to homestead the abundant, fertile land in the new State of Nebraska. Jan Willem grew up on his father’s farm near the town of Holland, Lancaster County, Nebraska, about 20 miles south of Lincoln. In addition to learning the skills required for farming, Jan Willem also desired to pursue a career in the ministry. Jan Willem attended the local school, which was growing rapidly because of the influx of immigrants to the area. According to historian Gustav Adolph Bade, “attendance increased from forty-seven in 1875 to one hundred six in 1884, and an attendance of one hundred seventeen is reported for 1886.”[1. Bade, Gustav Adolph, “A History of a Dutch Settlement in Lancaster County, Nebraska”, Chapter VI, “Education in the Pioneer Settlement”.] After graduating from high school, Jan Willem moved to Holland, Michigan, to attend Western Michigan Theological Seminary. He graduated from seminary in 1897 at age 30, and in the same year married Geertje VanderBeek (1871-1922). His first church assignment was in Carmel, Sioux County, Iowa. From 1897 until 1904, Jan Willem served the church in Carmel as well as in nearby Hospers, Iowa. Jan Willem and his wife Geertje had their first child, Amy Margaret, on 8 October 1898, in Carmel, Iowa. Amy survived little more than a year, and died on 16 February 1900. Shortly before little Amy died, another daughter, Lillie Marie, was born on 8 December 1899, in Carmel. The first son, Eugene Arthur, was born on 10 July 1901 in Hospers, Iowa. A second son, Lawrence Edmond, was born in Hospers on 25 October 1904. During his time in Iowa, Jan Willem heard stories about Yakima Valley, in the State of Washington, where many Dutch immigrants had settled. Sometime in 1904 he decided to transfer to a new church in the town of North Yakima, Washington (which is now simply named Yakima.) However, Jan Willem soon became overwhelmed by all of his responsibilities as minister — advisor, counselor, preacher, fundraiser, bookkeeper, etc, and his wife Geertje was the church organist. In addition, he said that the church women would gossip against each other and complain to him about the others. Finally, Jan Willem felt that he just could not take it anymore. While in North Yakima, Jan Willem had heard about the State of Colorado, and the abundant farmland that was available for homesteading. He decided to leave the church ministry and move his family from Washington to Fruitland Mesa near Crawford, Delta County, Colorado. where he planned to farm, grow fruit, and raise cattle. Apparently the Colorado climate and life style agreed with Jan Willem, and he stayed in Colorado for almost 20 years. Built about 1917 of two-by-six inch boards, the massive barn had a diameter of 48 feet and was 32 feet high. A cupola topped the round barn and a huge long ramp to the second story provided easy access to the cement silo constructed inside the barn… On the first floor of the round barn were located 25 stanchions for cows, each served by a trap door in the ceiling from which feed could be dropped into feed boxes. 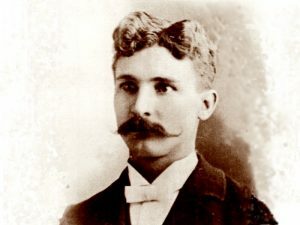 According to the recollections of his daughter, Johanna Margaret TeSelle Fries, by 1922 Jan Willem was having financial difficulties on the ranch. He was not earning enough to pay the money owed to the government for the property, and he felt as if he “was not getting anywhere.” His wife Geertje had died on 4 March 1922, and Jan Willem was left on his own with five children. The oldest children, Lillie (1899-1997) and Eugene (1901-1986) were able to help care for the younger children and the farm, but Jan Willem, now age 55, felt that it was time to abandon the farm and return to the ministry. In 1923, he accepted a call to serve a church in Matlock, Iowa. Note: Read four of Jan Willem TeSelle’s letters to his children, written during the period 1923 – 1939. During his lifetime Jan Willem was a minister as well as a rancher. He is probably best known for his construction of the large, round, red barn on the plains at Fruitland Mesa, Colorado. He died in Firth, Lancaster County, Nebraska, on 20 January 1945, just a few days shy of his 78th birthday. John Willem TeSelle - Round Barn (as reported in The Daily Sentinel"
John William (Jan Willem) had two wives during his lifetime: Gertje Van Der Beek and Jeannette W. Bogaard. John William TeSelle (1867-1945) and Jeannette Bogaard (1884-1973), married from 1923 until his death in 1945. Gertje (Gertie) Van Der Beek (1871-1922) and John William TeSelle (1867-1945), married from 1897 until her death in 1922.